The Animal Qigong – – a human practice of cultivating good health and fitness by imitating animals as a symbol of nature, vitality and longevity, is the oldest type of Qigong in history. Archaeological findings show that Chinese people were imitating the turtle’s gesture and breathing as a practice over five thousand years ago. The Five Animal Qigong or Wu Qin Xi was created some 1,700 years ago by a master Chinese doctor and Qigong practitioner named Hua Tuo. It imitated the movements of the tiger, deer, bear, monkey and bird. Since then it has been widely practised all throughout history, and it is still one of the most treasured Qigong methods in modem time. Over the years, various styles of Wu Qin Xi has been developed, just like in Taiji Quan there are different styles all from the same root. However, in today’s world there are only a few Qigong teachers who are able to pass on the transmission and teach this method. Being the most physically strengthening and energetically empowering method in Hua Gong, the Hua style Five Animal Gong is practised by imitating symbolically and physically the movements, breathing and sounds of the five animals. It consists of some standard forms of movements, spontaneous movements and sounds, and simple but effective techniques that can be practised sitting, lying or even travelling on the airplane. It can be used as a method of healing, a style of arts and a way of spiritual channelling. The benefits of this method have been experienced by many who have participated on this retreat before. Without exception, there were remarkable stories demonstrating the extraordinary effects of this practice. Carrying rich information, its effects are not only physical and energetic. It is also an effective way of emotional catharsis and mental cultivation. For example, the tiger form is a great way of expressing and transforming anger and the monkey a strong approach of sharpening the mind and our senses. The symbolic connotation of the animals can have great effects on our state of mind and behaviour. The dignity and masculine power of the tiger, the elegance of the deer, the earthiness and soft strength of the bear, the graceful and free spirit of the bird and the liveliness and vigilance of the monkey, all. imprint their marks on our consciousness and helps us to be more upright, confident and overall refined. 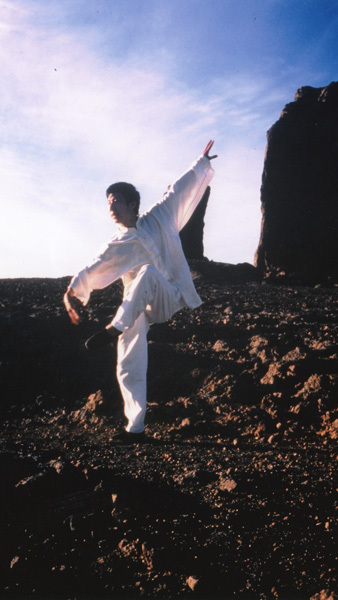 In Qigong jargon, this method internally cultivates our essential energy Jing (essential body liquid such as the sexual fluid), Qi (airy and flowing subtle body energy), Shen (the mind and spirit), and externally strengthens the bones and muscles, and improves the quality of our skin. Relatively, the tiger and deer are more focused on the Jing aspect, the bird and bear the Qi, and the monkey the Shen. Externally the bear and monkey are particularly good for the bones, the bird the skin, and the tiger and deer the muscles and ligaments. The Five Animal Hua Gong is often recommended as the first Hua Gong retreat.